One of the two major changes the T brings to the OnePlus 5 is the display - it's now a 6-incher in a fashionably tall 18:9 ratio. OnePlus brands its displays as Optic AMOLED to signify that they're custom-built for them (by Samsung). This one is Full Optic AMOLED - like Samsung's Infinity, LG's FullVision and Huawei's FullView, 18:9 displays (or 18-ish in Samsung's case) must have a word in there to indicate that they are extra special. This one has a 2,160x1,080px resolution, like the Huawei, but unlike Samsung, LG, and Google's top offerings, which employ higher-res QHD+ panels. At 401ppi, however, pixel density isn't too shabby, Diamond Pixels as they may be. In our testing, the OnePlus 5T managed almost 440nits of maximum brightness, in line with current top-class AMOLEDs when in manual mode. The difference is that Samsung's own phones get a healthy boost in Auto mode, while the 5T doesn't. Then there's the iPhone X which has all of its 680nits of maximum brightness available at your disposal, sun or no sun. For twice the price of the OP5T, admittedly. Minimum brightness is 2.1nits - we've rarely seen a lower number. Those who are in the habit of using their phone in the dark will appreciate it. Contrast is, predictably, infinite - blacks are truly black, blacker even than the LG V30's sort of black blacks. The OnePlus 5T's display excels under direct light, so much so that it beats the reigning Galaxies (if only just). The iPhone X is the only one it can't match, but apparently OnePlus sourced the panel just as well. Hint, hint. Color reproduction on the OnePlus 5T gives you the best of both worlds. You can have a more muted but quite accurate (average DeltaE of 2.3) sRGB rendition in, well, sRGB display mode, or opt for richer color in the Default mode (average DeltaE of 6.9 measured against an sRGB target). The phone's display is capable of displaying a wide color gamut, and in the DCI-P3 mode, it scored an average DeltaE of 2.0 against the respective target color space. Excellent! There is also a Custom color mode, where you get a Cold/Warm slider to set the color temperature to your liking. We're happy to report that we didn't observe any strong and unpleasant color shifts when looking at the 5T from odd angles. We had stopped mentioning this but the V30 and the Pixel 2 XL changed everything. 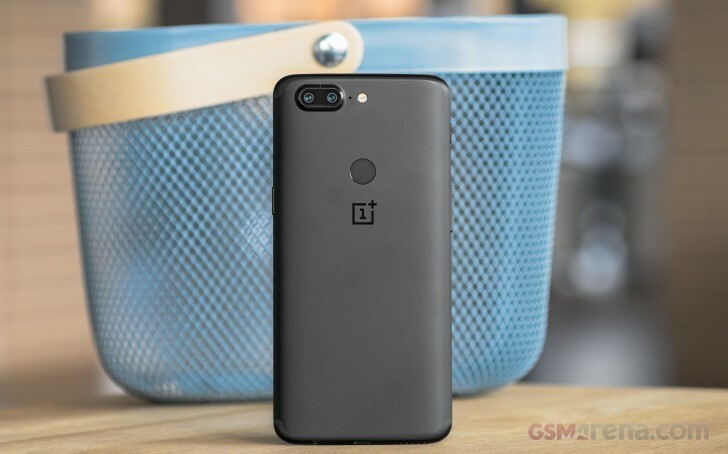 The OnePlus 5T is a dual SIM device in all of its incarnations, which is one - there's just a single global version. It takes two nano-SIMs. A total of 35 bands of 2G/3G/4G are supported, and LTE is Cat. 12/13 for theoretical speeds up to 600Mbps of downlink and 150Mbps of upload. There's no gigabit LTE on the OP5, even though the Snapdragon 835 chipset is heavily advertised to support it. Hardly a deal breaker, this. Wi-Fi b/g/n over 2.4GHz and a/n/ac over 5GHz is supported. There's the latest Bluetooth 5 with improved range and speed plus aptX and aptX HD for those who are into high-quality wireless audio. NFC support is another check mark on the spec sheet. Positioning is done with GPS, GLONASS, BeiDou, and Galileo satellites, so basically all of the publicly available systems. There is no FM radio receiver, though. The charging and wired connection uses a USB-C interface, but the one on the OP5T only adheres to the USB 2.0 spec, and not the 3.1 - while OP isn't the only one to do it, it's still worth complaining here. On a positive note, a 3.5mm jack is present so you can connect them OnePlus Bullets (or any other pair of headphones, really) without the hassle of a dongle. The battery capacity has remained unchanged - the 5T packs the same 3,300mAh as the 5 despite the larger screen. The V30's capacity is the same, but other competitors fit more - the Pixel 2 XL has a 3,520mAh power pack, while the Mate 10 Pro's 4,000mAh are unrivaled. The Galaxy S8+ needs to power a slightly larger display off a 3,500mAh battery. In our testing, the OP5T proved more than adequately powered, securing an 82h Endurance rating - which is about what the OP5 got overall. In the screen-on tests, it posted slightly lower numbers than the outgoing model, but that's to be expected - larger screen, same battery. 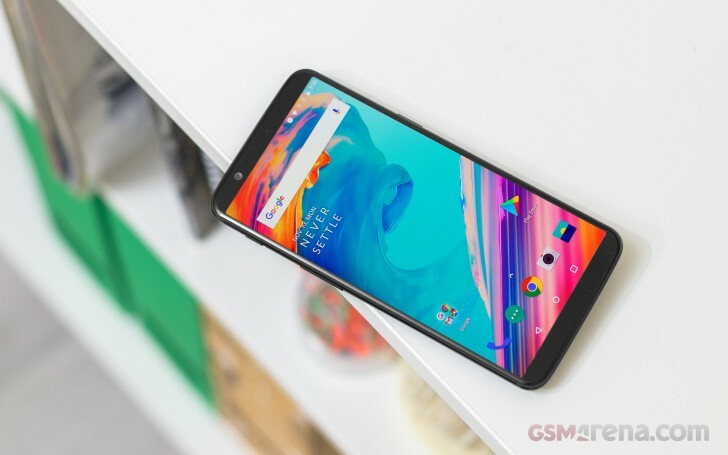 Still, with more than ten hours of web browsing and close to 17 hours of video playback, the OnePlus 5T shouldn't leave you wanting. The Mate 10 Pro will, indeed, give you 5 hours more on the web (15:21h), though it would quit looping videos an hour and a half before the 5T (15:24h). The Pixel 2 XL will match the 5T web browsing endurance (10:29h), but fall 5 hours short in video playback (11:45h). The Galaxy S8+ will outlast the OP5T in web browsing by a couple of hours (12:16h) and stop an episode short of the 5T in video playback, but a 16h binge should suffice, we reckon. The OnePlus 5T is slow to discharge, but lightning fast to fill up. Using the proprietary Dash charge adaptor and cable it'll get you from 0% to 100% in about 55 minutes, while a 30-minute charge takes it from flat to 65%. Truly impressive stuff! The caveat is, of course, that with non-Dash accessories you won't be able to go anywhere near these charging speeds. Our endurance rating denotes how long a single battery charge will last you if you use the OnePlus 5T for an hour each of telephony, web browsing, and video playback daily. We've established this usage pattern so our battery results are comparable across devices in the most common day-to-day tasks. The battery testing procedure is described in detail in case you're interested in the nitty-gritties. You can also check out our complete battery test table, where you can see how all of the smartphones we've tested will compare under your own typical use.